Can Ocean Conditions Explain the Lack of Biofouling on MH370 Debris? As a point of reference, I’ve reproduced the current chart from that post (above). Though in reality the currents are not nearly as deterministic as depicted–there is a randomness to the motion of floating objects that causes them to spread out, like a drop of ink in a bucket of water–it does accurately portray the overall movement of things. 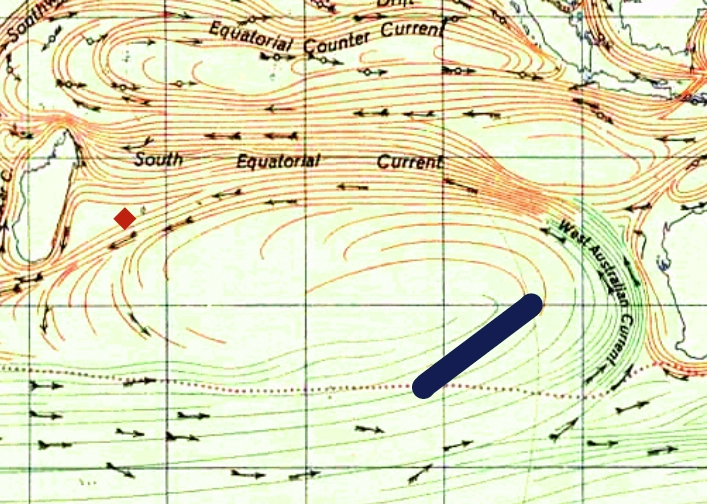 The black bar represents the area where Godfrey thinks the plane most likely impacted the water, northeast of the current seabed search zone. He points out that to get to the locations where they were found on the coast of Africa, the pieces would have to have either passed around the northern end or the southern end of Madagascar. In the image below I’ve sketched out what these paths might look like, more or less. The pink oval represents the central gyre seen in the current map above. The yellow line is a hypothetical path proposed by Godfrey that the flaperon might have taken on route to Réunion. 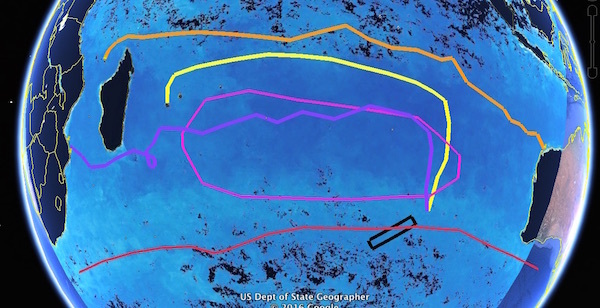 The orange line is a hypothetical path that the capsized boat which washed up on Mayotte may have taken during its eight-month drift from northwestern Australia in 2013-2014. 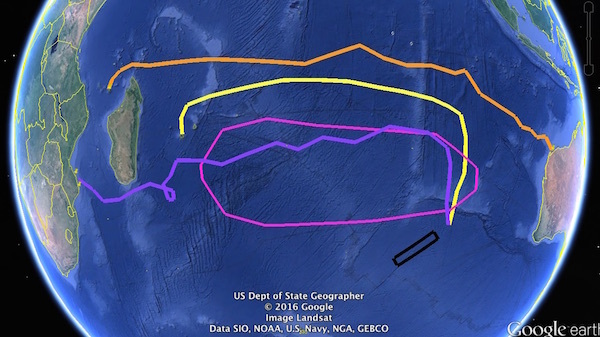 I suggest this is a plausible example of a “north route.” The purple line is an even more hypothetical proposal for a “south route” that I just sketched out freehand after watching some drift simulations. If floating debris took a path passing slightly further south of Madagascar then it could remain in colder waters (especially between July and October) below 30S, under which circumstance barnacle attachment and growth is contra-indicated. Thus it might be that the three items found on the coast of Africa reached their destinations via such more-southerly routes… The Paindane item (‘676EB’) discovered at around 24S may well show some evidence of marine life, even though it most probably arrived via the southern route past Madagascar, mainly occupying cooler waters… The Mossel Bay find (‘Rolls Royce’) might not be expected to show evidence of marine life because it was discovered at around 34S and may well have spent most of its ocean transport time in the cooler waters below 30S. 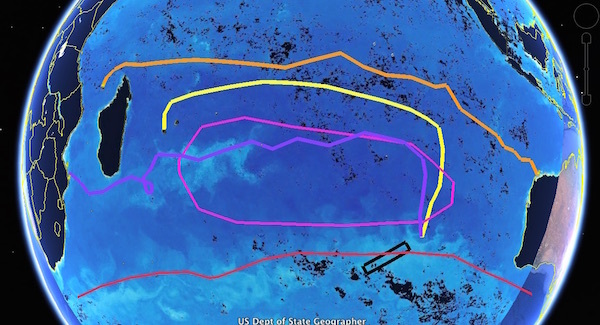 To get a sense of where this transition zone occurs, I traced it out on Google Earth and superimposed a surface-temperature chart lifted from Godfrey’s post along with the previously described drift routes. As is quite readily apparent, all the routes lie entirely within anatifera’s range. Note also that the southern boundary lies well south of the gyre, meaning that anything that drifts beyond it is going to be swept eastward. It’s entirely possible that a piece of debris might have neared Africa and then been swept south into cold water that killed the anatifera, but after that the piece would have been carried back towards Australia. In order to move back west it would have to have first drifted north back into anatifera habitat, where it would have had approximately a year to get re-colonized. Remember, Lepas reach sexual maturity in 60 days and achieve full size in six months to one year. So these pieces should have been carrying a load of biofouling similar to the Réunion flaperons even if their initial population was killed off by the cold. 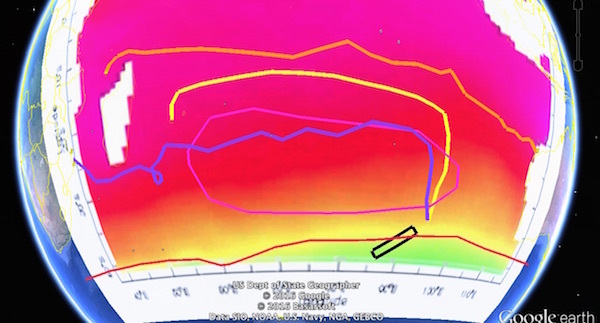 Broadly speaking, there is an area of relatively low nutrient levels in the middle of the SIO that grows and shrinks with the seasons, being biggest when the water is warmer. In the warmer latitudes transient high-nutrient patches can be found, but they are transient in time and space. The southern end of anatifera’s range experiences consistently higher levels of nutrients, as does the ocean between Madagascar and the African mainland. Although it appears likely that the floating debris from MH370 was carried westwards towards Africa by the Indian Ocean South Equatorial Current through warm waters (i.e. where barnacle attachment and growth is feasible), these waters have relatively low concentrations of chlorophyll in the maps above, and therefore limited amounts of phytoplankton, and this militates against substantial barnacle growth. 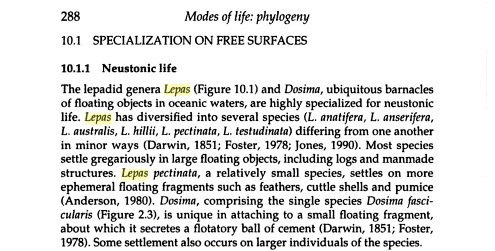 The problem with this analysis is that the piece of debris which spent the greatest amount of time in the center of the Indian Ocean, with its low nutrient levels, is the flaperon, which has the greatest accumulation of Lepas, including some which have reached full size. The clean pieces, by contrast, have spent considerable time in the nutrient-rich waters near Madagascar. An alternative reason for the Réunion and Rodrigues items being barnacle-encrusted but not the other three might be as follows. The lepas (goose barnacle) colonisation may be a feature of proximity to coastlines inhabited by lepas colonies. Therefore, debris ‘dropped’ into a mid-ocean region (i.e. the crash site) might be expected to be ‘clean’ of lepas barnacles until free-swimming barnacle nauplii, released from reproducing coastal colonies, are encountered. Again, Thompson has the situation reversed. Lepas are pelagic creatures which are adapted to rafting on the open ocean. Buoys placed far out to sea become heavily settled by them. @Phil, You’re right, I shouldn’t have stooped to an ad hominem attack. @Jeff, in principle I agree with your description of what might have been going in the cockpit. Personally I cannot hear any signs of stress whatsoever. But the repeated mistake to get the flightnumber right is odd IMO. Of course, in order to assess this correctly one would need to compare this dialogue with other audios from other flights. Maybe it’s rather common that the cockpit crew gets the flight number wrong or has difficulties remembering it? Apart from that question I do think it’s worth exploring if the cockpit could have been taken over before the last words were spoken. Good explanation about low arousal on a would-be humdrum routine red-eye flight and inserting the “new” information (MH370) into their dialogue which has to be pulled from recent memory. But one could argue both of them? Newbie Fariq on his first solo flight should have been on his toes to impress, and “methodical” Zaharie? That is what doesn’t fit to me with both of them slurring the number throughout? So then up to that point (17:19) are you saying they were not under hijack or aware of any perps due to their performance? Interestingly enough it’s reverse in the Miracle on the Hudson episode, it was ATC slurring the flight numbers under known extreme duress. Captain Sully was cool and collected. With that I am now going to get some sleep for the night, back tomorrow. I looked at and listened to the audio again, and I have to retract my idea that the pilots might’ve tried to draw attention by slurring repeatedly the flight number. They get it right a few times as well and the slurring starts far too early for being compatible with the idea that the cockpit was taken over that early. While I find the repeated slurs odd, I cannot see any pattern here which hints at something being amiss. My memory must’ve been playing tricks or I was so eager to hear what might stick out that I didn’t hear anymore when they were getting it right. And that might be our trap: we are so eager to find out if something was amiss early on that we start to overinterpret little oddities. Of course it’s possible that the cockpit was taken over before the famous last words were spoken. But the audio doesn’t show any signs of that. “cabin disintegrating” bull’s eye, dude. A huge piece in my own jigsaw. You got a link for that, mate? You criticize the Maldives story but write theories about the plane taking the northern path towards Russia and Kazakhstan. Do you get the point here ? Do you also realize that the Maldives story (stupid as it sounds) is much closer to the real MH370 story than the northern path -riddled with military radars- ? The fact that 5 pieces of 9M-MRO turned up in the southern Indian ocean also does not help your northern scenario. Please help explain this inconsistency. The northern or southern path ? If the latter you need to denounce your northern theory. If the former you can’t criticize Maldives sightings. Agreeing with @jeffwise. It happens to me every working day that pilots mistake their callsign by one or few digits. It seems to me that it’s much more likely to happen in early stages of the flight (initial climb or first cruising level reached) than in late stages (since the callsign has been already repeated dozens of times on previous frequencies). Sometimes pilots might even say the callsign of the previous flight, still fresh in their minds from a few hours back ! I agree as well that the recording could be classified in the “routine” section in the english classroom at my workplace. After hearing it twice, I’m thinking that I wouldn’t have pickep up anything particular, have I been working there that particular night. Which lessens IMO the theory that the crew tried to warn ATC that something was going on. And those pilots disappear after a minute ? @Steve, good to know that you with your professional background cannot detect a smoking gun hidden in the audio. As you might’ve seen, I retracted the idea that the pilots might’ve tried to get a message across. Jeff’s assessment is probably spot on and the repeated failure to get the flight number right could simply mean that they were inserting new information into a routine dialogue. That explains well why both pilots have this little hickup, while they are getting all other words right. @Trond, @Wazir, The “cabin disintegrating” call never happened. Please stop spreading misinformation. @ir907, I get it, you’re sneering at Kazakhstan because it’s “weird.” Well, what happened to MH370 was clearly unprecedented and strange, so for a theory to seem weird should be to its credit. As far as I can discern at the moment, a spoof scenario to the north is technically feasible (the issue of military radar and debris are valid ones, that I will address in the near future.) The Maldives scenario is not physically compatible with the data in hand, which is why we’re taking it off the table. 1. The Factual Information transcripts record conversations between ATC and multiple other flights besides MH370. I count 23 handoffs where ATC gave the frequency of the next controller to contact. The frequency was repeated by the pilot in 22 instances. The only one to fail to repeat was MH370 being handed off to HCM. 2. For two of the handoffs (besides MH370), I was able to locate the moment at which the flight contacted the next controller. In both cases the delay was just a few seconds. 3. MH370 was transferred from one controller to another 4 times. Excluding take-off, the longest delay before contacting the next controller was 30 seconds. Zaharie handled two of the handoffs. For the first one, he repeated the frequency, and the delay before contacting the next controller was 13 seconds. We thus have two oddities regarding the handoff to HCM. First, the frequency was not repeated, and second, HCM was not contacted within the expected window of time, even though the transponder continued working for more than a minute. 1. In my undestanding AES does not proceed without updated position/velocity data. If so, what does prevent insertion of artificial delay programmatically? 2. Why do you think it is impossible to alter AES software? Once again, I don’t really take this seriously, but I can’t recall why it was discarded as “impossible” rather than “improbable”. ADRIFT looks like a normal tool, apparently designed for both hindcast and forecast. I did not find much documentation and test-cases, so it is difficult to say how good/accurate it is. However, there is a plenty of limitations and uncertainty in the input parameters, so that results should be viewed as indicative rather than absolute. This is equally applicable to any drift model. 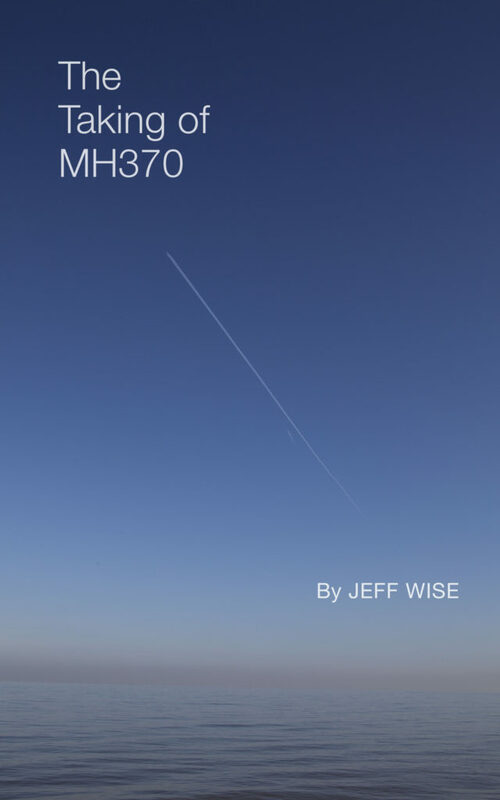 Brock has published a review of drift models applied to study MH370. You can find it at Jeff’s site (~end of 2015). Delft3D, CSIRO (forward) are good models in my opinion. NOC UK also were working on PT model, but I have not seen their final results. Again, don’t expect various models to show identical results – that is normal. But backward approach is flawed in principle. Has the UFO from flightradar24 been discussed here? What was up with that? The last thing I heard is that they turned it down due to a glitch. @sk999, interesting observations on the different handovers. Did you time the copilot as well? Sorry @Jeff, I was just picking on @trond’s info. I am relatively new to this blog and thought he was mentioning a previously discussed issue regarding something authentic given someone else responded that it ( the cabin thingy) was in cold storage for the time being. I have no intention whatsoever of spreading misinformation land whatever comments I made are based solely on the available data to IGARI and subsequent ground observations, no more. My sincere apologies if that has been misconstrued. Can we agree that it is a waste of time to split hairs over the precise characterization of the probability that spoofing happened or not? Moreover, the entire premise that anyone would think about doing this is absolutely preposterous. You have to start with the theory that anyone would have predicted, with high probability, that Inmarsat engineers and authorities would figure out how to derive flight paths from BTO/BFO housekeeping data, which is not used routinely for anything other than making sure the AES was not off in the assigned frequency/time-slot weeds. Multiply the probability of that X all the other improbable requirements and you get a number <0.0001. For me that is as certain as things get in the story of MH370. @ M Pat: you promised us a write-up on your buoy study–still waiting for it. Or did you post it somewhere and I missed it? Just asking because people are asking me for more detailed explanations of your intriguing charts. re: Madagascar current patterns: when looking at the NE coast (Antsiranana province) on google earth, when judging the current direction by looking at beach erosion patterns, the current looks like it flows to the south in imagery dates from May, but appear to flow to north in October/November images. Thus, it could be that given the timing of the African objects that they could have passed north of Madagascar before entering the swift Mozambique and Alguthas currents, that could imply that the objects spent a lot of time in coastal/beach microenvironments that would have been inimical to gooseneck barnacles. For whatever it’s worth, I remember that the general opinion is that it’s not possible to deploy the flaps without engines or APU or on the RAT. On a 777 it’s seems possible this way. Or am I missing something? Seriously, though, we really can’t speak of probabilities here. Something was either done, or it wasn’t done. And I understand that you find this scenario “preposterous,” but all that really means is that you can’t conceive of a group of engineers pulling this off. I think it’s dangerous to assume what other human beings can and can’t do. This was the lesson of “Lawrence of Arabia” as I recall. The Russians have surprised us before with their unexpected technical prowess–remember Sputnik? In the spring of 2014 they were involved in a very dangerous game of deceit mixed with violence, having annexed the Crimea under the pretext of an indigenous uprising. MH370 disappeared mere days later. And four months after that, a Russian Army missile launcher deliberately destroyed another Malaysia Airlines 777, under the very skillfully constructed cover story that the shootdown actually was carried out accidentally by untrained militiamen. This has been documented in great detail by Bellingcat. One final note: the spoof that you’re describing, with a ground-based attempt to generate false BTO and BFO values, is vastly more complicated (as you pointed out yesterday) than a aircraft-based spoof of BFO values alone, which would only require the change of a single parameter in the SDU. @Wazir, No problem, I’m just trying to make sure we’re all pointed in the same direction. How many times do I have to say it? I can and have conceived of it, but I can also see that it is so unlikely that it should not be considered when it comes to defining the search area. This idea is up there with Black Holes and alien abductions. BTW…Didn’t I send you a schematic block diagram of what it would take to do it back in 2014? I wouldnt touch the MH17 and Ukraine subjects if I were you. It is common knowledge that Russia is not an aggressor, while the rulers of the west are anti-human. Has alsm checked his basement lately making sure the station-prototype hasn’t been lifted? Shutting comments here. Please respond to the most recent post. Thank you!